Per Jonsson from Kiruna is one of Scandinavia's most respected telemark skiers on the free skiing- and big mountain scene. Since 2011 he’s an ambassador for Kero and can through our products feel at home, wherever in the world he travels. Per Jonsson was born in Kiruna in, about 200 kilometres northwest from Sattajärvi. Being raised in a town where it’s winter almost the whole year, he naturally awakened an interest for winter sports. As a 5 years old he began playing ice hockey for Kiruna IF, but after 15 years he lost his interest and took off on an adventure to Canada instead. In Canada he spent time with his telemark skis, which developed into a new passion. To switch of sport changed his whole life, today he is a professional freeskier in Telemark and have won the Nordic Championship in freeskiing 2010, 2012, 2013 and 2014. - I had a classmate who were skiing telemark and I thought it looked so nice, so I tested and got stuck. I really love the surfing feeling and the sense of freedom it gives me, Per explains. 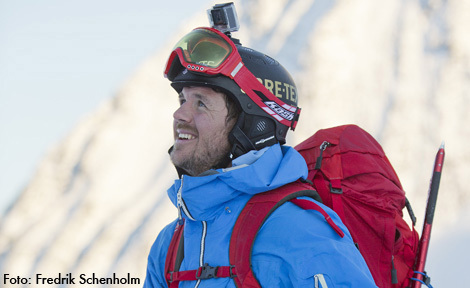 Per is traveling around the world, constantly in search of the perfect ski experience. Six years ago, he gave the, at that time, unknown ski resort of Sochi in Russia a shot. - In 2008 we decided to go to Krasnaya Poliana in Sochi. So this was long before they had the Olympics and the ski resort got worn out. I did not really know what I could expect, but in the back of my mind, I had the image of Russia with; poverty, alcoholism and harsh attitudes. And I tell you this; my prejudices were true. It was like traveling back in time; no one spoke English and no one had ever seen a couple of wide powder skis. And even though we couldn’t communicate with them some inhabitants took us under their wings. They showed us the mountain and taught us how to drink liquor like real Russians. We had a lot of fun, but pretty strange, days with them, but the best with the whole trip was surely skiing. The snow was magical, waist-deep every day. High mountains and magnificent scenery. The skiing was world class, far from what I had imagined. It is really sad that Sochi has become so overexposed nowadays, what appeared on television during the Olympics is just the pieces of what it once was - a skier's paradise, Per says. - Another fun skiing adventure I have experienced took place last year. I had been invited to Japan to participate in a skiing event. In the car on the way up to the mountain Japance warned me and told me to prepare myself for some attention and autograph writing. I didn’t really understand why, but while up on the mountain, it turned out that I would participate in a ski show. I was immediately nervous because I had never before participated in one. I wondered what I would do and was told that I should go fast and jump in a jump. I had no idea how to do it and how big the jump was, the Japanese just said; "Just go!". You can imagine my thoughts in the lift up. Once at the top there was a guy waiting for me. I asked where I was going to ski and he pointed down toward a red piste in style with sloping parking lot. I looked down the slope and saw a jump in the size of a child jump in a children's slope. I didn’t get it, was this really what I’ve traveled here for? But the most surreal of it all was the crowd of Japanese people standing beneath the slope waiting for me. I skied the red piste in fast speed, jumped the jump and when I came down the Japanese cameras pelted while happy screams echoed between the mountains. They were so impressed that I had to do it all over again. There must probably be the craziest thing I have ever experienced in my skiing career so far, Per says with a laughter. When you compete in Telemark, there is a predetermined "competition area" with a start and a goal, but in between you basically get to ski exactly how and where you want. When you ski you’ll get reviewed by a jury who judges you on line selection, technique, aggression, control and flow. This is turned into a summary judgment. The more technical line you choose, the faster you go, the higher you jump - the better it is. It’s all about getting something really hard and advanced look as neat and simple as possible. - Before a competition, I study the competition area and plan where to ski. I memorize my lines and then think through how I want to go there. For me it's a lot about the mental part. I need to feel calm, relaxed and safe to perform well. In the lift up, I am usually very nervous and worried. It therefore becomes important for me to shut out all negative thoughts as much as possible and just focus on what I’m about to do. It's all about realizing your own limit. We all have our limitations, mental blocks and levels. But if you just holds to your limit, that’s when you perform at your best. And of course; you need to find your line and be sure how you want to ski, Per says. In winter, when Per doesn’t compete in Telemark he goes along with various crews around the world to find the best snow and conditions for the nice ski films. One of the crews calls themselves the Free Radicals and have making films in the Alps, Sweden, Norway, USA and Canada, to name just a few. - Before we book the trip we check weather pages to try to figure out where we might find best conditions in the coming days and weeks. We try to find areas where the snow is good and there is not that much people. This is because we do not want other ski tracks in the image than our own. The actual recording day begins, of course, to climb the mountain, in 99% of cases we’re climbing by foot, it is very rare that we get escorted by helicopter, but sometimes it happens. The days are mostly about a lot of pulsing in the snow. The cameraman is mostly filming from the opposite side of the mountain, to get the best angle. We communicate with him through talkies. You let him know when you’re ready, then you ski and he tapes your run. It may sound easy and the film only shows the fun part, but it could be really frustrating and above all, it takes a lot of time, Per clarifies. Today Per lives in Stockholm, but for this Kiruna-guy Swedish Lapland has a natural place in his heart. And that's exactly what he appreciates with Kero; that he can bring the north wherever he goes. Except that he feels at home with Keros products, he thinks that they have products of the highest quality, stylish design, and that he can identify himself with their brand. - The products have an appealing simplicity with a clean and timeless design. I think Kero is genuine and I appreciate that the people behind appear to be passionate about the products. I wear my leather bracelet 24/7, I only take off my Kero x Denim Demon when I sleep and when I'm out on ski trips my Halsväska is always with me. For me it's an honor to be Kero ambassador, Per Jonsson says. Per describes himself as a guy who is everywhere and nowhere. He believes that life is too fun to be doing boring stuff. He therefore lives a very active life where he wants to seize the day. During the winter season, the telemark skiing is obviously his priority and the ski holidays and ski film production, including Free Radicals- that comes with the skiing season. When he’s not skiing he’s activating himself with everything from biking, running, weight training, socializing with friends and spending time outdoors. Also he is working "off-season" on Haglöfs product development and marketing. With that said; rest can be done while in the tomb.